I am always looking for tunes that are unique, great lyrics in a musical format that I have never heard before. A song like that is hard to find because pretty much everything is evolution of what came before, so when I heard “You Don't Seem To Miss Me” I nearly jumped out of my seat with excitement. This is a really great song with a lovely story and wonderful and interesting music. 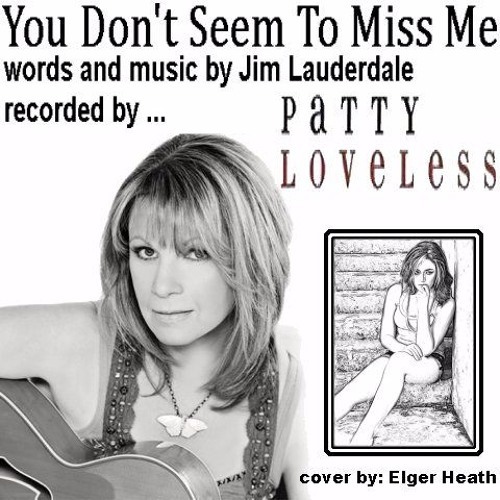 Written by Jim Lauderdale, a recording artist in his own right, it was recorded by Patty Loveless in 1997. This became a hit for her and I can see why. First it's just an exceptional song and second she mad a heck of a recording with it. If your haven't heard the original recording do yourself a favor and check it out. In the meantime, here is my basic, one track cover of this piece. I hope that you enjoy it.